Convenient kit has essential tools you need to build, repair, or modify a custom AR-15/M16 rifle - without duplicating the common tools you already have. 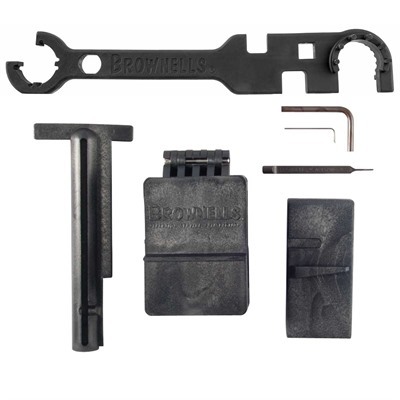 Includes our top-quality Brownells Armorer's Wrench, necessary for installation and removal of any barrel with either encapsulated or peg-style barrel nuts. Also has wrenches for flash hiders, M4-style castle nut, and A2 buffer tube nut. Lower Receiver Vise Block snaps into the magwell just like a magazine to provide a secure clamping surface for a vise without risk of damaging or distorting the receiver. Heavy-duty clamshell Upper Receiver Action Block lets you clamp the upper in a vise to remove or install the barrel or perform other work without crushing, twisting, or damaging it. Fits carry handle and flattop receivers. Two pivot pin tools: one retracts the spring-loaded detent, so you can remove the pivot pin completely from the receiver; the other retains the detent and spring while installing the pivot pin. Bolt Catch Pin Punch has a flat handle that clears the left side of the magwell for easy removal of the bolt catch pivot pin by driving it to the rear. DO NOT USE ON BILLET UPPERS OR DAMAGE TO THE UPPER CAN RESULT. SPECS: Armorer’s Wrench - Investment cast steel, black finish. Fits barrels up to 1-1/4” O.D. Lower Receiver Vise Block - High-density urethane plastic, black. Receiver Action Block - Injection-molded Rynite®, black. Fits A1, A2, and standard flattop receivers. Pivot Pin Detent Tools/Bolt Catch Pin Punch – Steel, black oxide finish.